Another year and another Top Ten - finally! 2007 became The Year Colin Slacked Off on the Top Ten. I usually like to update it every month or so, but I got very lazy and didn't touch it since June. Ugh! Here's making a New Year's resolution to update the 2008 Top Ten more frequently! I think I find it hard to get too excited about the Top Ten because the DVD format is so stable at this point. Like I mentioned last year, the days of DVD innovation are long-gone. The format's reached a certain peak above which it really can't go. That's not a bad thing, but it does mean that it becomes more difficult to get really excited about much. I hate to sound blase, but almost all the big titles are out now, so we don't get humongous debuts like Star Wars or the like. The DVD format has become about new titles and refinement of old ones more than anything else, and that's fine. I also found it tough to decide what was really Top Ten-worthy and to position the various titles. Most years the Top Ten sorts itself out and doesn't require much debate for me. Often we find plenty of titles that are so strong they demand placement on the chart. In 2007, only one title stood head and shoulders above the rest, and it's number one on my list. After that I just went with my gut, as #2 could easily be #10 and vice versa. I could have jumbled choices two through 10 and made legitimate arguments for each slotting. There were a lot of very good releases in 2007, but other than #1, nothing that came across as truly superior. So for this chart, I paid less attention to specific grade ratings and just went with my gut. I decided to go with the titles that most impressed me. That made the list even more subjective than usual, but I couldn't think of a really logical way to choose, so I let my lasting impressions decide. I may never watch The Jazz Singer again since I think it's a lousy movie, but the three-DVD package dazzled me in many ways, so it deserved high placement. I may not care for the flick, but I maintained very positive feelings toward the set and went with my gut in that regard. Of course, the biggest subject in 2007 was the same as the biggest one in 2006: the high-res formats. HD-DVD and Blu-Ray battled it out throughout the year, not that many noticed. A dedicated cult of fanboys invested in one - or both - of those formats, but the vast majority of the world stayed with SD-DVD. According to a Washington Post article I saw, the two high-res formats sold about 14 million discs in 2007, while SD-DVD moved about 2.3 billion. That means the hi-res discs made up less than one percent of sales in 2007. That'll undoubtedly change in 2008, as I expect hi-res will make more inroads. This seems especially likely now that the "format war" appears to be close to an end. The recent signs make it look likely that Blu-Ray will emerge victorious, so by the time I write my 2008 Top Ten, the HD-DVD/Blu-Ray fight may be a memory. If that happens, Blu-Ray will clearly gain adherents among folks who wanted to wait for the format battles to come to an end. How will all this affect this website? Back when I wrote my year-end note for 2006, I mentioned the reasons why the DVD Movie Guide remained focused on SD-DVD. With the "format war" apparently close to an end, our eventual move to Blu-Ray reviews becomes more likely, but unless readers overwhelmingly tell me they don't care about SD-DVD and they want their Blu-Ray reviews, I plan to stay with SD-DVD. When one format outsells another by more than 99 to 1, that tells me that more folks will be more interested in the 99 than the 1. In early 2007, all the reader comments told me to stay SD, and that's what I plan to do until/unless I get sentiment to the contrary. So you tell me: are you sick of the SD reviews and eager for Blu-Ray? Or do you think other sites have been too quick to dump SD-DVD reviews? There's a link to my e-mail address below, and I'd love updated feedback on what readers want. While Blu-Ray may or may not be in this site's immediate future, readers can look forward to one technological change: a new TV for me! I've finally decided to take the 16X9 plunge, so I'll be moving to a spanking new Panasonic 50-inch 1080p set along with a new upconverting DVD player. I love my old WEGA and think it's served me very well over the last seven years, but I realize that it's become a little out of date for DVD review purposes so it's time to move into the 21st century. The site may take a week-long review break to give me time to get accustomed to the new set. I have to watch a bunch of discs I already know so I can get used to its quality; otherwise, my first reviews will be more about my reactions to the new set than to the quality of the discs themselves. Granted, that'll still probably be the case for a little while, but hopefully my adjustment period will keep things steady. So that sums up 2007 and where the site's headed as we move into 2008. Be sure to let me know your thoughts on what you'd like to see! As I alluded above, only one release in 2007 really dazzled me: the "Collector's Edition" of Blade Runner. Much has been said about all the positives of this seminal flick, and they're accurate. It remains a rich, involving film that continues to entrance. This DVD finally provided the film with a home video incarnation that lives up to its legend. The flick boasts stunning visual quality, very good audio and a simply spectacular array of extras. This goes down as one of the greatest DVD releases of all-time. Readers may wonder why I choose the four-disc CE instead of the five-disc "Ultimate Collector's Edition". Since the UCE is the same as the CE but adds some materials, shouldn't I call it the best DVD of the year? Yes, the UCE is superior to the CE, but it also costs more than twice as much money. I factored the price into the equation when I made this choice. I don't normally worry about price when I choose the best DVDs, but then again, the top releases aren't usually almost $45 more than versions of the same film that are nearly as good. I like the UCE but it's not worth the money, while the $35 CE is a bargain. I don't think I've ever placed a movie I don't like this high on a year-end Top Ten. However, the Jazz Singer set so impressed me that I felt it needed special recognition. The movie is valuable for historical reasons, but I don't enjoy it at all. Warner Bros. did a great job with its restoration, though, as it looked and sounded better than anyone could have hoped. Add to that a virtual treasure trove of extras that will delight film buffs and this ended up as a truly great package. Never did I think that I'd cite an Elton John concert as the best I saw in any particular year - especially when I also saw personal faves like Springsteen and the Stones in that same year. But Elton's big 60th birthday show at Madison Square Garden was an absolute delight and a very memorable evening. This DVD brings the excitement and richness of that night home in a well-produced set. It reproduces the entire three-hour-plus concert with good picture and sound quality and adds a true treasure trove of archival Elton performances. This goes on my short list of Best Concert DVDs of All-Time. Boy, did I wait a long time for this one! I loved Face/Off when I saw it in 1997, and I always hoped that we'd someday get a home video release that really did it justice. With this two-disc "Special Collector's Edition", we finally receive a high quality Face/Off. The flick looks and sounds just great, and the extras add immensely to the set. I had to wait 10 years, but I'm glad I have this one. While Dreamgirls doesn�t make me lose my usual aversion to musicals, I do think it usually works. The movie entertains and fares well within its genre. I certainly can�t quibble about this excellent release, as it combines fine visual and audio quality with some terrific extras. Hey hey - it's a year-end Top Ten two-fer! I found so much in common between these two movies and DVDs that I thought they should be listed together. 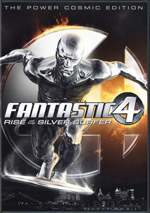 Both 2005's Fantastic Four and 2007's Rise of the Silver Surfer provide moderate entertainment; neither excels, but they maintain our attention. These discs made my list simply because they're both such strong packages. Both look and sound great, and they offer lots of fine extras. If the films were better, I might've listed one of both of these higher, but they're still too strong not to make it to number 6. Arguably the best movie on my 2007 Top Ten, only Taxi Driver and Blade Runner also appear on the AFI 100 list. I can't say that I've ever truly embraced Driver, but I recognize it as a very high quality piece of work, and I'd place it among Scorsese's three best flicks. The DVD makes it look and sound better than ever - almost a little too good for such a gritty flick - and the DVD offers excellent extras. The original 1999 DVD wasn't bad, but this one's a considerable upgrade. When I write up these Top Tens, I always battle rankings for movies with great technical specs that I just don't like. The Passion of the Christ clearly falls into the category. As a film, I find it flawed, but as a "Definitive Edition" DVD, I find it tough to malign. Yeah, if the set carried over the DTS track from the original "barebones" release, it'd be even better, but the included Dolby Digital mix is no slouch. Picture quality is excellent, and we get a truly extensive roster of extras. It's a very fine release. I hate to put movies I don't like on a Top Ten, but when the DVD proves as strong as this one, I feel like I must. The Transformers was one of 2007's most disappointing flicks for me. I thought it'd be an action-packed blast but instead it was incoherent and dull. At least the DVD excels in all possible ways, as it scores high marks in picture, sound and extras. I just wish I enjoyed the film itself. Speaking of bad movies, Caligula ensures that Transformers isn't the worst flick on my Top Ten. Indeed, Caligula isn't just a bad film - it's a legendarily bad film, the kind that could've crushed careers. Since I don't like the movie and the DVD's picture and sound quality are average, you might wonder why I would place it on my year-end Top Ten. I felt it deserved the attention because it's simply such a winning package. The mediocre visuals and audio really couldn't be helped, as they likely represent the product about as well as possible. The depth of all the extras make this one a winner, as it presents fascinating documents like a rarely-seen alternate cut of the movie along with much more. Never has so much love been lavished on such a terrible flick, but I really admire this release. For the statistically minded out there, I tallied the Top Ten by release dates. October was a big, big month in DVD, as five of the 11 titles came out that month. That's the single biggest month in the history of my Top Tens; never has one month contributed such a high percentage of a final chart. (In case you're puzzled by the reference to 11 DVDs in my Top Ten, remember that I had a tie with the two Fantastic Four releases.) Six other months produced one Top Ten title each: January, May, June, August, September and December. For more statistical fun, I examined my eight Top Tens by studio. For that span, Disney wins with 20 of the 80 possible slots. They did nothing to help themselves this time, though; for the first year, not a single Disney title made my final Top Ten. Fox comes in second with 15 DVDs; note that I didn't count the two Fantastic Four releases separately, as that didn't seem fair. Everyone else brings up the rear. Warner made the race tighter, as their 14 now has them only one behind Fox. Sony and Paramount both nailed eight slots, which marked a big jump for Paramount since they snagged three this year. New Line came in with six, while Artisan and Universal have two. Anchor Bay, DreamWorks, Image Entertainment, Universal Music and TGA - the latter produced the Rolling Stones' Four Flicks - both came in with one disc apiece, though to be fair, new DreamWorks DVDs go under the Paramount banner; if I nit-picked and separated them, DW would go up and Paramount would decline. No releases from MGM, Criterion or any of the other smaller companies ever landed on the year-end Top Ten, though some of them appeared in the monthly iterations.